Sylvesters is a relatively new restaurant on the corner of West Nicholson Street and Potterrow, close to Field, which we visited recently. It was a familiar site for me as I used to work with colleagues in Informatics at nearby Edinburgh University and we often lunched at what was then Phenecia, which became the Pink Olive. It’s been refurbished as a clean modern space and, from overheard conversations, It’s still patronised by university folk. We went on a Friday in January, which is not the busiest time in the restaurant business, but there were enough people there to create a good atmosphere. The menu is a short, bistro-style menu which does not have pretentions to ‘fine dining’ and so is not stupidly expensive. I started with Camembert, onion and fig tart. Instead of a traditional tart that I expected, this was a deconstructed layered tart – but no less delicious. Others had Haggis Bonbons i.e. deep-fried haggis balls. These have become a wee bit of a cliche in Scotland but these were very good. 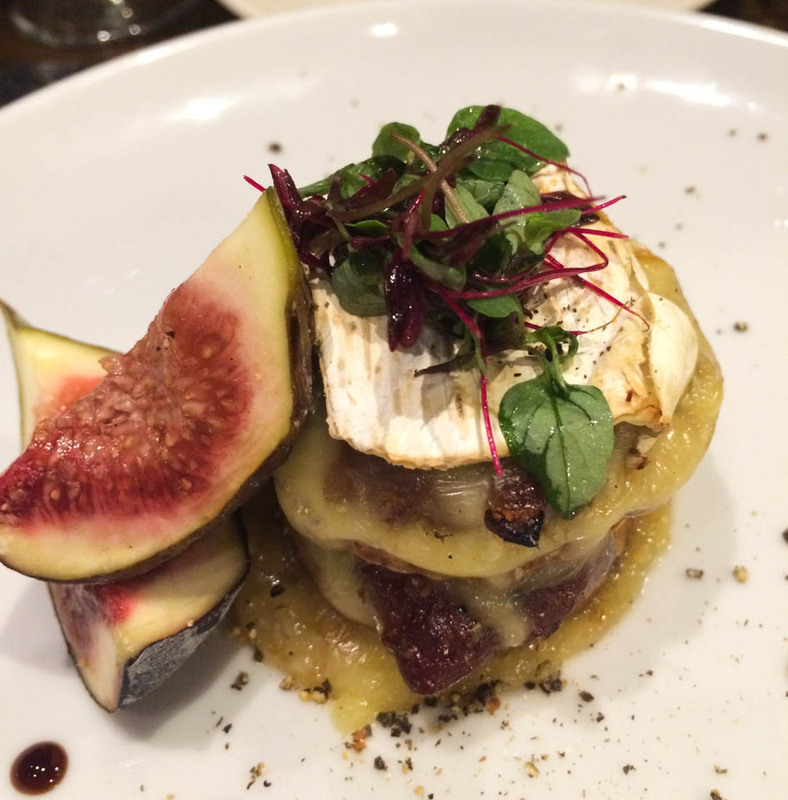 My main course was Jacob’s Ladder – something I’d never heard of before. 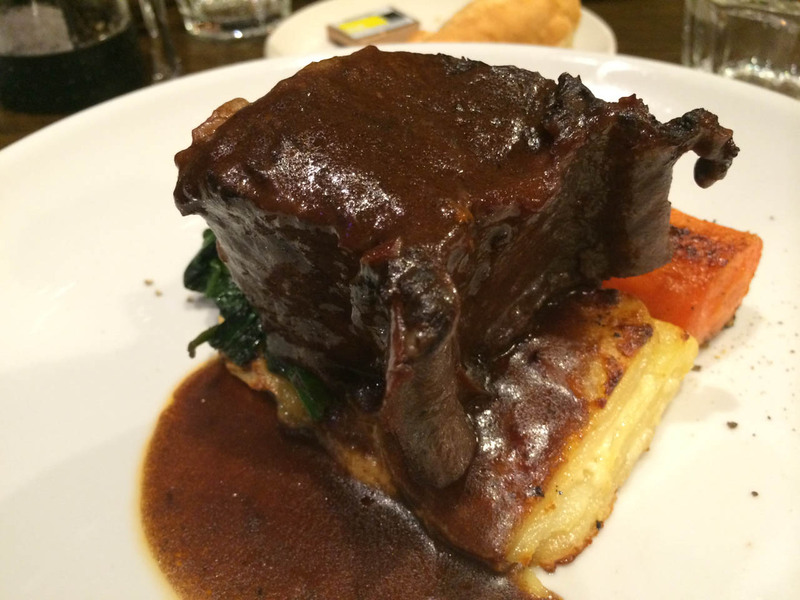 It was slow-cooked short rib of beef (which apparently is called Jacob’s Ladder) with Dauphinoise potatoes and spinach. It was absolutely delicious and not at all stringy as sometimes happens with slow cooked beef. I also tasted the pork and the hake – the fish in particular was excellent. We had a present of Prosecco as an aperitif and a pleasant but unremarkable New Zealand Pinot Noir to drink with our main course. The service was excellent and very friendly and the price was reasonable – about £28 per head. Sylvesters confirms the usual Edinburgh rule – you get the best value for good food if you get out of the city centre. Definitely worth revisiting.